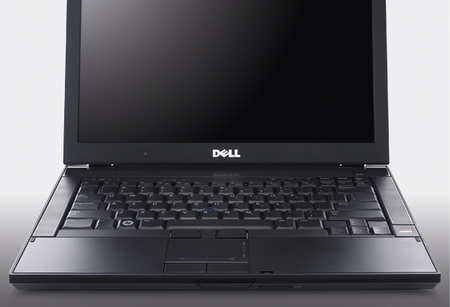 Review Dell supplied us with a Latitude E6400 set up for German use. Appropriate given the laptop's design that seems Teutonic in its slab-like seriousness. The other word it brings to mind is "ThinkPad". Let's have a quick look along the Latitude's straight lines and angles, all free from the fripperies of curves. Like the IBM ThinkPads of old, the E6400 looks like it means business. Black clad and no-nonsense, this is truly the Judge Dredd of laptops. The left side is home to a VGA port, two USB 2.0 ports - one of which doubles up as an eSATA connector - and, toward the front, a smart-card slot. The cooling vent's in the middle and slopes back from the top, just as the optical drive does round the other side. Next to the multi-format DVD burner, you'll find a four-pin Firewire port, a PC Card slot, a switch for the wireless sub-system, audio sockets and two more USB ports. Like the sides, the front slopes away from the wrist-rest edge and is home to a five-in-one memory card slot. The battery's at the back - clad in grey to stand out from all the black - in between Gigabit Ethernet and DisplayPort connectors. 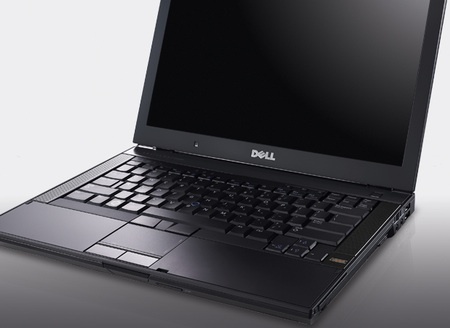 Open the E6400's lid and you're presented with the 14.1in screen. There's a webcam in the bezel above it - below the screen sits the ambient light sensor that can be used to adjust the display's brightness in harmony with the lighting conditions you're in.